Tipping has me stymied. Not in terms of dining out, having my hair highlighted, or requesting that a bellhop hold my luggage. Unlike some of my fellow millennials, I understand the etiquette behind that kind of tipping. If you are performing a job in the service industry that benefits me, especially if it goes above and beyond the call of duty, I probably owe you a tip. So why in the world is there now a tip jar at my favorite self-serve fro-yo place? To illustrate this conundrum properly, let me explain how this particular frozen yogurt establishment works. I walk in, pick up a cardboard bowl, pout if they don’t have cake batter flavor, briefly contemplate nonfat or low-sugar options, and then pull the lever on the full-fat flavor that most suits my fancy. Next, I bypass other indecisive patrons and loose children and head to the toppings bar. He pushes a button on the register. Then he reads me the number on the register screen that we can both see. Afterwards, he points at the spoons. He watches while I swipe my card. Finally, he says have a nice day. If he remembers. Am I really supposed to tip him? I understand that I’ve oversimplified his job in many ways. There are certainly behind-the-scenes things that he does that benefit my fro-yo experience. I’m not saying that he does nothing. But he hasn’t served me in any capacity that is different from a cashier at Target, a stock clerk at the local grocery store, or the fry scooper at McDonald’s. All these people have arguably unpleasant jobs. But we don’t tip them. 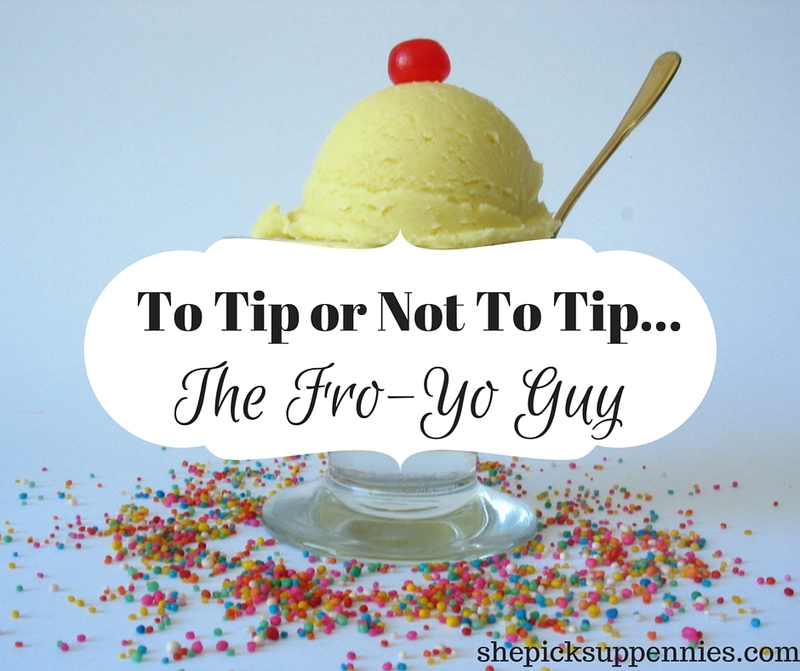 So, I need you set me straight once and for all: Do I tip the fro-yo guy? *My fro-yo is practically health food now. Antioxidants, for the win. **In the spirit of full disclosure, I do tip. I figure better to err on the side of caution than to be a jerkface. And also, I can’t do what I do with tip jars at Starbucks, which is to avoid them by not going, because frozen yogurt is serious business. So Tell Me…Do you tip the fro-yo guy? How much? Why not? Help a fro-yo lover out! Tipping has gotten out of control. I ate at a Mo’s Southwest Grill the other day….and they had a tip jar out! It’s fast food! Right? And unless these places are all changing their policies, the workers are making better hourly wages than actual servers. So I guess I don’t really understand it. Fair minimum wage is another argument for another day, but the number of tip jars seems excessive. I do not tip the fro-yo gal (in my neck of the woods). It seems crazy. And maybe I’m a jerkface for saying so. I never tip at fast casual, whether that’s Fro-Yo, Panera or anything else. Tips are not the primary way that these folks earn an income. My tip won’t affect the way they do their job, so I don’t value tipping. At a restaurant, I know that I can signal that I am a good tipper and therefore receive better service. I wouldn’t tip in this case. Seems that tipping is just expected in so many places now. It makes no sense to me. Tipping shouldn’t be expected, it should be done only because you receive a good service. After all, these people are doing their jobs right? Why is it expected to tip waiters and waitresses at restaurants but it’s not expected to tip cashiers at grocery stores? They’re doing their jobs too no? I’m glad you see it this way, too! Tipping has definitely evolved past the To Insure Promptness business. I always viewed tipping as a way to supplement the paltry “server” hourly wages or as a bonus for someone who does something really well. There’s one reason that I have tipped at the Fro-Yo place, and I only felt I had to do it once: When my daughter made a huge mess that involved more than usual clean up. She was 3, the yogurt was blue, there was whipped cream involved. You get the picture. And I think that’s the key in tipping at what is essentially a self-service place. Did you cause the worker to go outside of their normal duties? Did you need something extra in terms of what they did for you? If you did, then a tip is warranted, to the extent you were a nuisance. Otherwise, what are you tipping for in that environment? I truly appreciate you saying that. Actually, the last time we were at the fro-yo shop, there were middle schoolers (not my students, thankfully) who were absolutely awful. I gave a few bucks to the tip jar because I knew the employees had extra work to do to clean up their mess. We’re so torn in situations like those, but we usually drop a dollar in the tip jar in most cases. The way we think of it is: No one does that job because they have a passion for froyo. They do it because they need the money, and they are almost certainly not being paid enough to support themselves or a family. So we tip. But then we also wonder if tipping tells the employers that they don’t need to pay the employees more, which frustrates us just as much. At Marriott hotels, which we frequent for work travel, they even go so far as to put an envelope in the hotel rooms asking you to tip the housekeepers. To me, this is ridiculous, and basically broadcasts, “We don’t pay our housekeepers a respectable amount, but rather than do the right thing, we’re going to make this YOUR problem!” Argh. But then I usually drop a five in anyway, because I know how little they earn. Sigh. I do think those envelopes are odd. I always tip housekeeping, because I think it falls in line with the whole “to insure promptness” business. You’re cleaning my room well (I hope), so here’s my thanks for that. Overall, you make an excellent point – we could bypass all this guesswork and awkwardness if employers paid a bit more. People argue that the cost gets passed on to the customer (of course it does! ), but I don’t have to tip, and theoretically the employer is attracting and keeping high-caliber workers. I’ve worked in food service to some degree for five years now. As a waitress I made $2.13 an hour, so all my esrnings smenfrom tips. People who don’t tip servers are bad people in this gurls opinion. I bet your fro-yo server is making around $8 an hour. Not enough to live on, but not as low as bartenders or waiters. I say play it by ear. Feeling generius? Tip. Not? That’s ok.